Attorney General Eric Holder said Monday that he has authorized "significant" actions related to the criminal investigation of WikiLeaks as the website faces increasing pressure worldwide for publishing sensitive U.S. diplomatic cables. 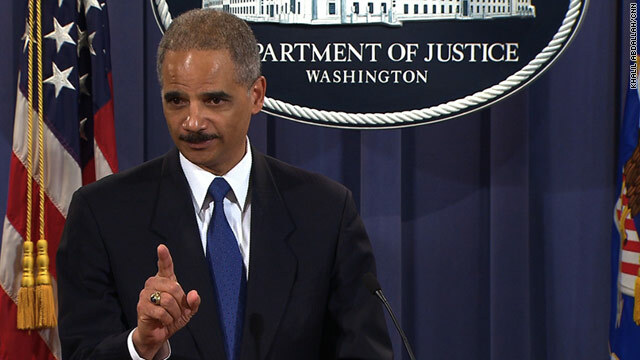 "National security of the United States has been put at risk," Holder said. "The lives of people who work for the American people have been put at risk. The American people themselves have been put at risk by these actions that I believe are arrogant, misguided and ultimately not helpful in any way. We are doing everything that we can." His comments came as a Swiss bank announced that it had closed the account of Julian Assange, the website's founder, dealing a second financial blow to the site in a matter of days. Eric needs to be fired.he sued az to protect illegals,which is against law to be an illegal.now he wants infringe on rights.what next?communism.im tired of hearing we have to.Take your civil rights for national security. Eric holder should be hunting down osama bin laden,no he will protect him like he did with illegals in usa.this j.e.r.k has too much power. I dont believe a private in the army had all that info.eric holder go investigate the fed reserve that give 9 trillions dollars in secret loans to private banks without gov approval.did the banks pay it back?no.ceos got billion dollars pay of taxspayers.corruption. Eric go investigate the fed reserve for handing out taxpayers money to private banks without gov approval?meanwhile people lost their homes from banks that receive 9 trillions dollars of secret loans.Why didnt main st get free interest secret loans from the fed reserve? I will never post on cnn,they censor what u write,infringment on freedom of speech.